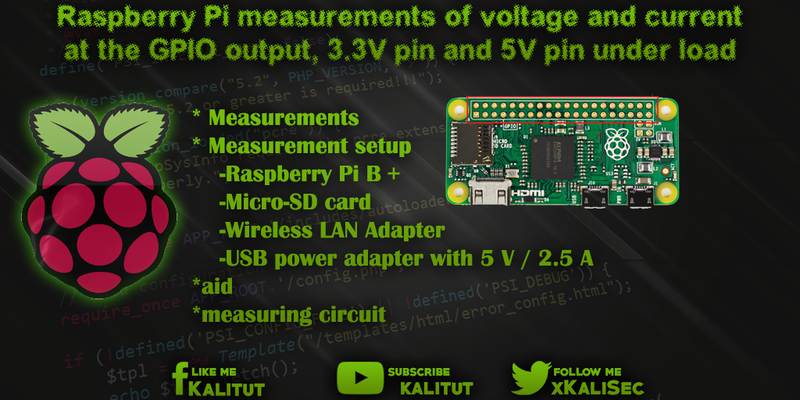 Measurements of voltage and current at the GPIO output, 3.3V pin and 5V pin under load Anyone experimenting with electronic components and circuits on the Raspberry Pi will be plugging in the 3.3V, 5V and GPIO pins. Anyone experimenting with electronic components and circuits on Raspberry Pi will be plugging in the 3.3V, 5V and GPIO pins. As a rule, one will rely on the well-known electrical values of these pins. But unfortunately that's only half the story. And that's exactly what can happen to you when you look at the GPIOs of the Raspberry Pi. Then you will notice some strange behavior. You will only master it if you are able to measure voltage and current with a measuring device. Let's take a practical example: If an electronics novice operates a pre-resistor LED on a high-end GPIO output, he will not notice any conspicuousness due to a lack of comparison. However, an electronics practitioner will find that the LED is not as bright as expected. A final measurement of voltage and current shows that there is no 3.3 V applied to a connected GPIO output, which would have been expected. However, this also means that all calculations and dimensioning of components and circuits are questionable and may need to be calculated with other values. The changing voltage behavior has to do with the flowing current. Looking at a GPIO output as a voltage source, then this has an internal resistance, which runs in series with the external circuitry. And that means the 3.3V are shared by the internal resistance and the external circuitry. How precisely the voltage on a high-level GPIO output changes can be determined with a series of measurements. For this purpose, a GPIO output is connected in series with different resistors through which a current flows, which causes a voltage drop across the resistor. The same measurement series can also be performed on the 3.3V and 5V pins. The voltage is measured parallel to the resistor. The current is measured in series with the resistor. Both measurements are done sequentially, not simultaneously.